I was a member of the 236th Med Detachment in Vietnam from April 1970 until the unit left in 1972. As a crew chief on the Dustoff helicopter I have many memories of picking up Marines in the field. In your Glossary of terms you mention “Dustoff” and have a very kind definition. We flew a lot of missions for the Marines out of Danang as well as a field site we had about 35 miles southwest of there that was referred to by three different names — Hawk Hill, Hill 29 and Charger. We were based west of the Danang Air Base at Red Beach which was at the west end of the bay. I do want to say that although you were thankful for us being there when we came, we had the utmost admiration for you, the people that were on the ground fighting. I would like to share one distinct memory with you in case you were there. 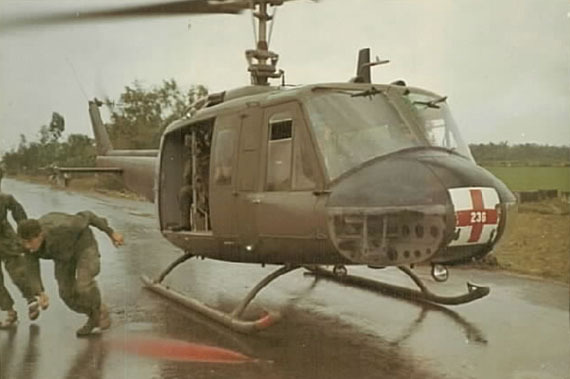 I am not sure when this was but I was part of the 236th Medical Detachment from April of 1970 to April of 1972 when they went back to the states. I have one distinct memory of a time when a group of Marines were south of Danang and stuck in a mine field. This was an open field and there was at least one casualty. The Marines were unable to move and not only needed a Medevac but needed to be extracted from the field. We went out there and there was a Marine CH-47 on site as well. I recall that there was discussion about the CH-47 possibly setting off more mines with its rotor wash and flying debris from it, as it hovered over the area to extract the Marines. As I recall we ended up hoisting the people out of there. I just thought I would run that by you in case it is something you recall. You have to realize the Marine pilots were not provided with the proper helicopters to do the job. We could go into and out of an LZ in an average of 20 seconds. Can you imagine how long it could take a CH-47, even if they hurried? I recall being told that we flew all night missions for the Marines because they would not fly the CH-47’s at night (or they couldn’t fly them effectively). I’ll tell you we would fly into an LZ even if it was insecure and they were currently taking fire on the ground. If there was an urgent patient waiting for us there we would go in. We took a lot of hits at times but we were able to get those guys out of there and to the help they needed. I’m not sure how much of this you might recall but our work was based off of three levels of priority for response. The first was a ROUTINE mission. When we responded to routine mission the LZ had to be secure, and had to be secure for a significant period of time. ROUTINE missions were for people who had minor injuries, malaria, the first stages of heat exhaustion, etc. The next level we referred to as a PRIORITY mission. Although I can’t clearly recall, but I believe the LZ had to be currently free from fire. These patients would typically have wounds to the extremities, such as gunshot wounds or fairly minor shrapnel wounds to the legs or arms. Of course if there was something such as a femoral artery that was hit the level would be upgraded. The last level of a mission we responded to was an URGENT mission. This level was for soldiers who had sustained wounds to their torsos and, or heads. Any head wound was considered by us to be URGENT. On URGENT missions we wound fly into an LZ that was currently under fire. We would work with the people on the ground, figure out the most promising approach and get into the LZ and back out with the wounded. Although we would take hits many times in these situations, we would get back to an aid station or hospital with the people that needed the help.